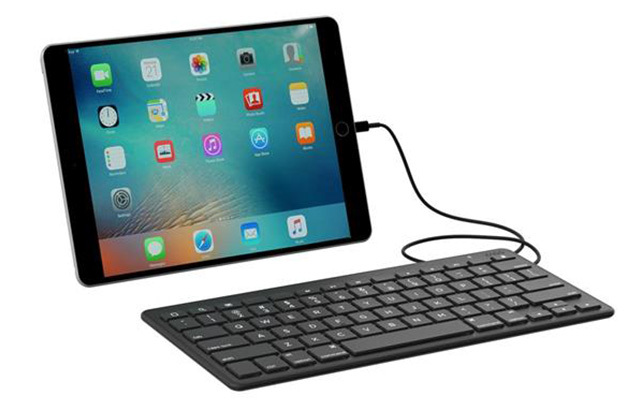 The wired keyboard gives any Apple iOS device with a Lightning connector the functionality of a laptop, with an easy and speedy typing experience. Users can take advantage of short-cut keys for often-used iOS functions. An 18-inch cord offers the flexibility to operate in different work environments. No batteries or charging are required. The wired keyboard allows users to avoid using Bluetooth in environments where they can’t, or don’t want to use that connection method. “If you have ever been in a school classroom or worked in a government office, you know there are some situations where you’re not allowed to use Bluetooth due to security concerns,” said Charlie Quong, vice president of product development for Zagg, in a statement. The Zagg wired keyboard is available on Zagg.com for $49.99. For more information, visit the company’s website.